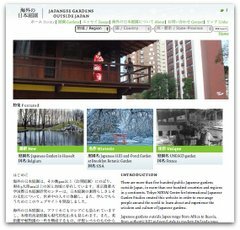 A US teacher’s blog reminded me of the importance of gardens in Japanese public schools. Loco teaches in a Yokohama junior high school, and remarked at how different Japanese and New York school facilities are. At his school, there are two ponds, turtles, fish, and carefully pruned trees. The gardens are largely maintained by the students and staff. In contrast US students generally have no responsibilities for cleaning their classrooms or maintaining the grounds. Another feature of Japanese school gardens is the frequent presence of at least one large cherry tree. These trees’ blossoms mark the ending and beginning of the school year in March and April. In the United States, there is now an Edible Schoolyard movement to bring vegetable gardens to schools as a way to educate kids about food and the environment. The Berkeley California middle school garden was founded in 1995 by noted cook and food activist Alice Waters, who is now advising the Obamas about the organic White House vegetable garden. It would be interesting to bring this school vegetable garden concept to Japan.